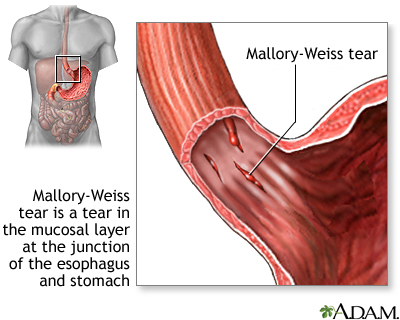 A Mallory-Weiss tear results from prolonged and forceful vomiting, coughing or convulsions. Typically the mucous membrane at the junction of the esophagus and the stomach develops lacerations which bleed, evident by bright red blood in vomitus, or bloody stools. It may occur as a result of excessive alcohol ingestion. This is an acute condition which usually resolves within 10 days without special treatment.